Pompeo, 54, has been chosen by Trump to relieve Rex Tillerson. The current CIA chief, on the other hand, shares the president's hard line on the nuclear pact with Iran and the conflict in North Korea. At his Senate hearing on April 12, criticism rained down on him. The future head of the US Diplomacy tried to sweeten his image as a radical hawk. "War is always the last resource," he said. The Congress gave Monday the first accolade to Mike Pompeo, the conservative hawk chosen by Donald Trump as the new secretary of state, after much controversy. The Senate Committee on Foreign Relations voted in favor of his nomination, which was in question until the last minute because he was strongly opposed by the Democratic opposition and Kentucky Republican Rand Paul, a loose line among. Paul, who finally gave his arm to twist, allowed enough votes and avoided failure in the committee. This rejection would not have prevented him from succeeding in the final confirmation in the plenary session of the upper house, but it would have made him the first head of US diplomacy since 1945 to take office without the prior recommendation of the committee. In the end, he has had 12 votes in favor and nine against. 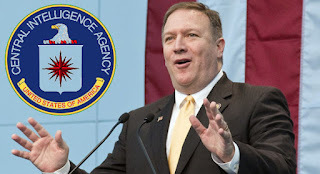 Pompeo, until now head of the CIA, provokes a lot of misgivings among the democratic legislators for his marked conservative ideology. He is a member of the Tea Party ultraconservative group, has been ambiguous about the use of torture, defends the hard line with Iran and has requested the death penalty for Edward Snowden, the security ex-analyst who denounced the massive electronic espionage of the United States. For Rand Paul, the evils of Pompeo have to do with his support for the war in Iraq, which Trump opposed in his day, and in general with a belligerence attitude that does not square with the libertarian profile of the Kentucky senator. A few days ago, when the first resistances of the legislators against Trump's candidate for secretary of state began to appear, the news leaked that Pompeo and Kim Jong-un had secretly met in Pyongyang, a historical and preparatory meeting of the rendezvous that is being prepared between the president of the United States and the leader of North Korea. There was no meeting at such a high level as Pompeo's since Secretary of State Madeleine Albright in 2000 met with Kim Jong-il, father of the current dictator and head of the regime between 1942 and 2011. But the relevance of this appointment has not served to smooth the path of the nominee. In the Senate it does not seem difficult for Pompeo to get enough votes (this Monday he already knew of two Democrats who support him), but the difficulties in the Committee bothered Trump. The president argued that they need more republicans in the legislative chambers.